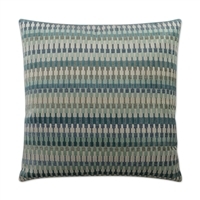 Pillows can make a significant difference to the aesthetic of a sofa, chair or bed. Adding throw pillows to your sitting area instantly invites you to sink into a cloud of comfort and our home décor pillows are the perfect accent. Choosing appropriate throw pillows is one of the final touches in decorating your home but certainly not the least important. Add a touch of color or texture to your furniture with our accent pillows. The right decorative pillows will help you transform a neutral couch into a bold piece of furniture or complement the luxurious patterns of your current fabrics. Choose from a variety of designer pillows that cater to coastal, modern, contemporary and transitional styles by viewing our ever-changing assortment of pillows at the Patrick Day Home Gallery’s Jupiter, FL, showroom.